WEST LAFAYETTE, Ind. - One of the most common house ant species might have been built for living in some of the smallest spaces in a forest, but the ants have found ways to take advantage of the comforts of city living. 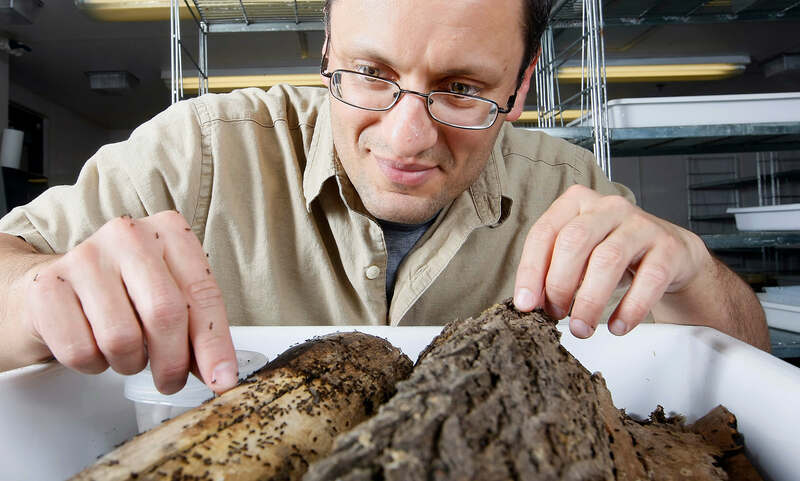 Grzegorz Buczkowski, a Purdue University research assistant professor of entomology, found that odorous house ant colonies become larger and more complex as they move from forest to city and act somewhat like an invasive species. The ants live about 50 to a colony with one queen in forest settings but explode into supercolonies with more than 6 million workers and 50,000 queens in urban areas. "This is a native species that's doing this," said Buczkowski, whose results are published in the early online version of the journal Biological Invasions. "Native ants are not supposed to become invasive. We don't know of any other native ants that are outcompeting other species of native ants like these." Odorous house ants live in hollow acorn shells in the forest. They're called odorous because they have a coconut- or rum-like smell when crushed. They're considered one of the most common house ants. In semi-natural areas that are a cross of forest and urban areas, such as a park, Buczkowski said he observed colonies of about 500 workers with a single queen. He said it's possible that as the ants get closer to urban areas they have easier access to food, shelter and other resources. "In the forest, they have to compete for food and nesting sites," Buczkowski said. "In the cities, they don't have that competition. People give them a place to nest, a place to eat." Buczkowski observed the ants in three different settings on and around the Purdue campus. He said it might be expected that if the odorous house ants were able to multiply into complex colonies, other ants would do the same. But Buczkowski found no evidence that other ants had adapted to new environments and evolved into larger groups as the odorous house ants have. He said it's possible that odorous house ants are better adapted to city environments than other ant species or that they had somehow outcompeted or dominated other species. "This raises a lot of questions we'd like to answer," he said. Buczkowski said understanding why the supercolonies form could lead to better control of the pests in homes, as well as ensuring that they don't outcompete beneficial species. Future studies on odorous house ants will include studying the ant's genetics and trying to understand the effects of urbanization of odorous house ants. Disturbance resulting from urbanization is a leading cause of biotic homogenization worldwide. Native species are replaced with widespread non-native species, and ants are among the world's most notorious invaders. To date, all documented cases of ant invasions involve exotic introduced species that are spread around the world by human-mediated dispersal. I investigated the effect of urbanization on the evolution of invasive characteristics in a native ant species, the odorous house ant, Tapinoma sessile (Say). Colony social structure, life history traits, and the spatial pattern of nest distribution were compared by sampling T. sessile across a gradient of three distinct habitats: natural, semi-natural, and urban. Results demonstrate a remarkable transition in colony social and spatial structure and life history traits between natural and urban environments. In natural habitats, T. sessile colonies are composed of small, monogyne (single queen), and monodomous (single nest) colonies. In urban areas, T. sessile often exhibit extreme polygyny and polydomy, form large supercolonies, and become a dominant pest. Results also suggest that urban T. sessile colonies may have a negative impact on native ant abundance and diversity. In the natural environment T. sessile coexisted with a wide array of other ant species, while very few ant species were present in the urban environment invaded by T. sessile. Habitat degradation and urbanization can lead to extreme changes in social and spatial colony structure and life history traits in a native ant species and can promote the evolution of invasive characteristics such as polygyny, polydomy, and supercolonial colony structure.